A quick review of events 6 & 7 of 37, and what a mad weekend it was. I've been looking forward to the first event since I booked it and a little apprehensive. I have heard some mixed reviews of the event last year as it was a different course to the one this year and so I didn't know really what to expect. 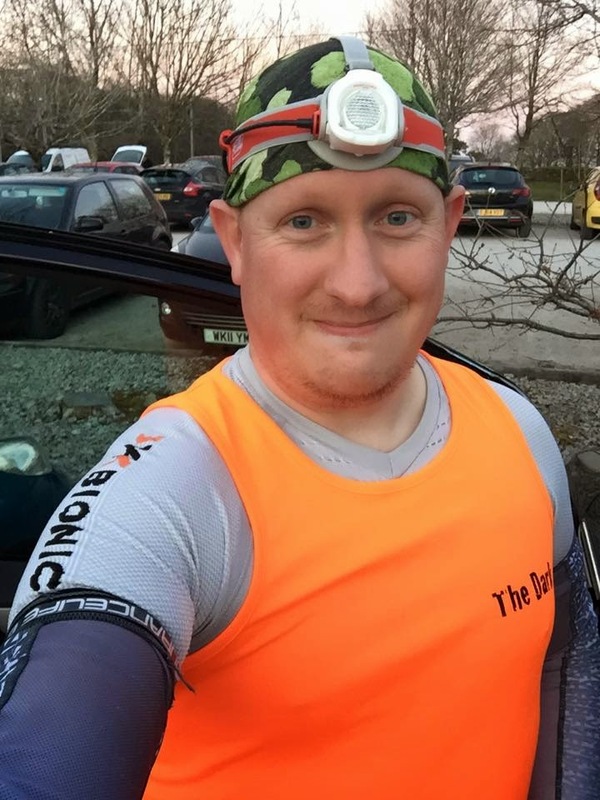 So Event 6 was "The Dark" a 10 mile (ish) multi terrain night race. Set in the beautiful grounds of Lanhydrock House in Bodmin. These beautiful grounds are looked after by the National Trust. The event is one created by Mud Crew who have under their belts others like "Arc of Attrition 100 Miles", "R.A.T the Plague 64 miles" and " The Scrooge". All events very successful, and having been involved in them or know people who have been involved in them be it as a runner, volunteer or supporter I knew the standard of the events. Knowing Lanhydrock as I do, I knew it wasn't going to be an easy course to start with and I definetly wasn't let down. After picking up fellow runners I made my way from Plymouth to Lanhydrock House just outside Bodmin, Cornwall and we arrived at registration in good time. Plenty of parking and with the sun still beaming down as it started to set, meant the weather was awesome. Registration was simple enough, seperated into Alphabetical Names I went to the right desk and picked up my mandatory bright orange Mud Crew Vest and Number. 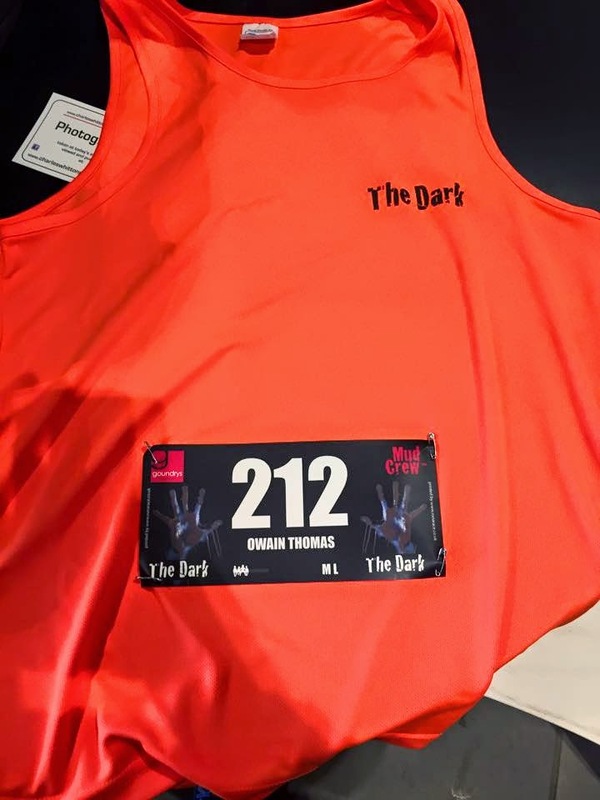 The vest was to be an outer layer to make the runners be seen more easily in the dark and the race number was good. It wasn't generically printed out and each one had the runners name on it which to me makes it a little special and a nice touch. The small attention to details does it for me. The sun went down pretty soon and so did the temperature as there was no cloud cover but the sky was covered in bright stars. 7pm came and all the runners soon left the warmth of the National Trust cafe and mustered on the start line. There was 6 members of my running club "The Plymouth Musketeers RC" there and we all gathered together chatting away as we awaited the safety brief. The brief was given and at 7.15pm as stated we were off! Now I fully expected when I turned up to be running by myself pretty much for the all of it, but the 6 of us without really talking about it, decided to stay together. We headed down the route and soon we hit the mixed terrains of tarmac, gravel, mud and grass. I don't think any of us were really planning on going all out, as one member already ran event earlier in the day and most of us had another first thing in the morning. As we headed around the course we started to hear some screams as someone was jumping out scaring and wasn't too long when we hit the first of the stonking great hills. Conserving energy we power walked the hills and ran the rest. The course was two laps of 5 miles so we knew we would be hitting those hills once more for sure. What goes up must come down and we did so. Right the way down to a river! It wasn't just a simple river crossing, we actually went along the river in and some parts the water came up past our knees and the river bottom changed from gritty to bog mud. It took team work I can tell you to get us round helping each other and informing where the sudden drops came. One part was a deep pool which they had two divers mainly for safety and also to cause the runners havoc as they tried to get through it. It was cold and luckily knew our feet would soon warm up again once back running. As we got past the water towards the end of the lap we had to get ourselves over the horse cross country obstacles. They weren't hard, but they were another thing to slow you down. Again we used team work so we stuck together and not leave anyone behind. Compared to the start where there was stream of orange vest and headlamps burning brightly we were starting to see gaps between runners and groups of runners. We approached half way with a water station and plenty of jelly baby type sweets I see two friendly faces who were there supporting their club runners. I quick hug and I was off again for the second lap. Just before it got dark! Already knowing it would be pretty much the same, I tried not to think to much of hills. Soon enough we were making our way up and down them. Again we hit the water and as we were already used to it, but it didn't get any warmer! This time though they through a tunnel under a foot bridge in. Taller people had to crawl on hands and knees, but if you are a short arse like me then you could just get away with bending over without having to get fully wet. The 6 of us still together, despite wee stops for some, we came towards the finish line and crossed the line together. 2 hours and 18 minutes later we finished 10 tough, dark, wet, muddy miles. The marshals were brilliant, and knowing what it is like to support and marshal in the cold I made sure I thanked every one each time I past them. Without them a lot of these events couldn't go on as they are volunteers. Andrew Ferguson and his crew did another great job. Those that did the year before I spoke to said this years was far better. The National Trust cafe were great as well, they stay open to cater for the cold wet runners and the supporters long into the night. Would I do it again? Yes but definitely with friends, it made it so much fun despite being tough. Well done Mud Crew! I wore my X-Bionic Fennec top and Running shorts (under my leggings) and X-Socks marathon socks. Despite being wet, my body remained warm and even though I had grit in my shoes from the river no blisters appeared much to my surprise. X-Bionic can be proud that their kit is dealing with the various tests I put them through. I also wore 3 Buff's, one for my head, neck and wristband. It was definitely a 3 Buff occasion. Event 7 Sunday morning was a local one called "Mad March Hare 10k" organised by Plymouth Round Table and only a few minutes down the road from my house. As my running club was paying for the entry fee it was rude not give it a go. 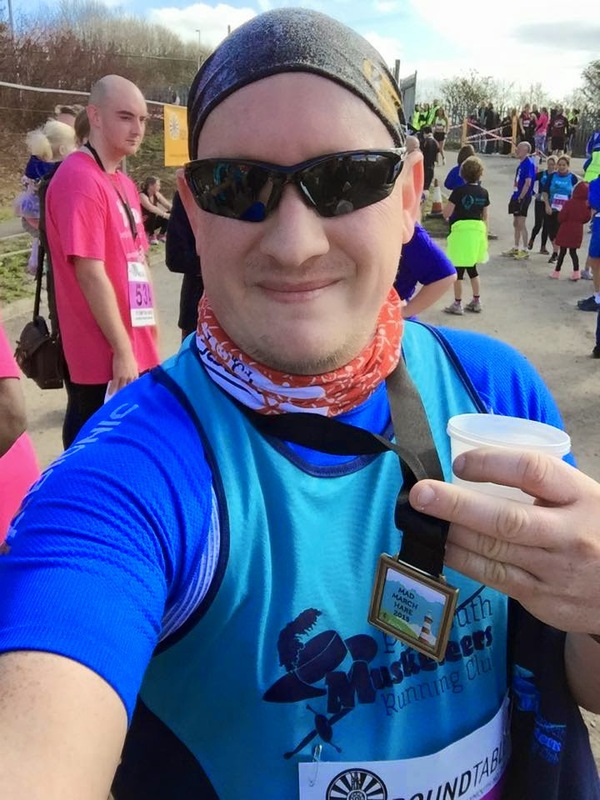 I have never run the race before so this was a new one for me, I however have run pretty much the route before in some form so knew what it would be like. Having got to bed about Midnight after dropping everyone home from The Dark, dragging my self out of bed in the morning was going to be tough. I did drag myself out and only eating a banana, I wasn't exactly fueled ready for the race after the event the night before. 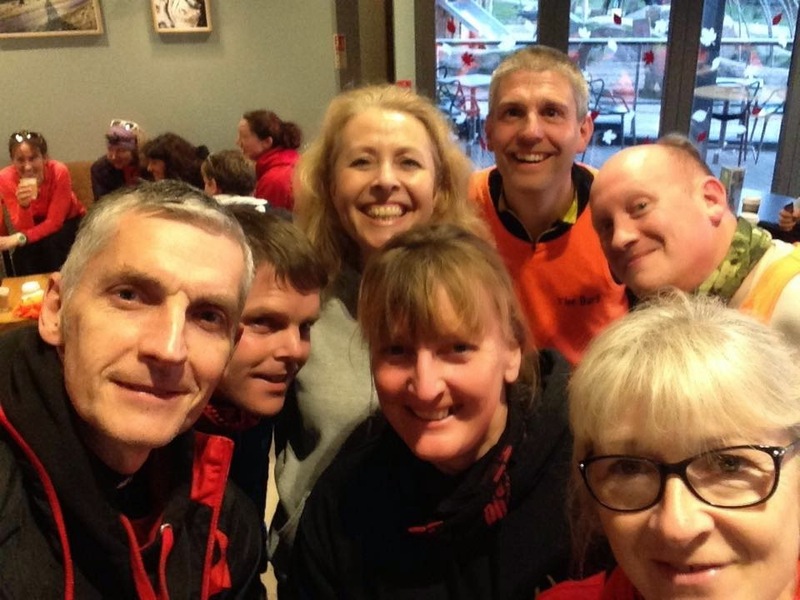 It was a 9am start and my fellow club runners who were running this event and not Tavistock Half turned up and we soon had a catch up. My plan was pretty simple, go out easy, enjoy the event and see how it goes. 9am O'clock came and off we went. Leaving the Speedcross circuit near Plympton at the start we turned left and headed towards Saltram Estate. The weather was glorious sunshine and despite being a little bit fresh at the start it soon warmed up. We headed along the estuary trail and followed around towards Saltram Hill. I was at a nice comfortable pace and chatting away with friends. One friend from the club had never run a race before this was her first. So I stuck with her and another from the club and encouraged them on. Soon enough we got to the top of the hill and turned back for last 5k to finish. The finish was where we started so mainly down hill on the way back. Again the marshals were great, and plenty of support out along the way. The event was well organised and received a nice little medal at the end of it. I wore my X-Bionic Trick top and another pair of X-Bionic Running shorts along with X-Sock Sky Run socks. They were great in the warm weather, kept me comfortable and the legs weren't tired. I also wore my new sun glasses provided by Sunwise. The Canary Wharf glasses are brilliant, so light and they didn't steam up like some do. They don't slip off your nose either when sweaty. Despite running on pretty much empty, I was ok. Tired but ok. I finished in 1 hour dead well off my PB of 48 mins but it didn't matter, because again I enjoyed myself and helped others. So that was Events 6 & 7 the next two will be up in Shropshire over Easter weekend!